Every year The Sunday Standard felicitates India's best bankers in over 15 categories, who come into the Capital from across the country for the ceremony. The New Indian Express believes that education is the key to national human resources development and that, as an intelligent society, we must create a holistic and high-quality education system for our children and youth. The New Indian Express believes that strong, independent women are the backbone of a nation. We have decided to act on our belief by organising a definitive event called Devi, which recognises and awards 20 exceptional women who display dynamism and innovation in their work. Unlike any other literary meets in India, Odisha Literary Festival organised by The New Indian Express promotes vernacular literature as much as Indian writings in English language. With the The New Indian Express publications religiously mapping cultural trends and events, it's no surprise that EventXpress (the events wing of TNIE) specializes in putting together events that bring India's top musicians and singers to the people, under the Sur Sangam umbrella. Fashion fades, only style remains the same", drawing on Coco Chanel's worldview, The New Indian Express chose the city of Bangalore to celebrate the everlasting charm of pure style, on March 21, 2014. The New Indian Express launched TNIE GOAL, an inter-college football tournament in Kerala in 2012. The idea behind this sports event is to revive the interest in football, especially among the youth and help discover talented sportsmen who could be trained and promoted to play at the national level. A joint initiative by The New Indian Express and Columbia University, the conference was organized in New Delhi in 2011. 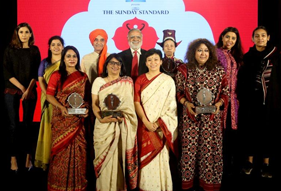 The New Indian Express (TNIE) Group's flagship event, the ThinkEdu Conclave was back with a bang for its seventh edition which was held on February 13 and 14, 2019 at ITC Grand Chola. More than 49 speakers spoke their minds and shared their Ideas for a New India, which was the theme of this year's conclave. 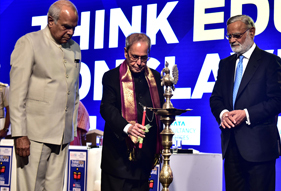 The conference was inaugurated by Pranab Mukherjee, former President and Bharat Ratna awardee and Banwarilal Purohit, Governor, Tamil Nadu both of whom shared their thoughts with the audience. An eclectic mixture of speakers were a part of this two-day conclave including politicians like Shashi Tharoor, Smriti Irani, Feroze Varun Gandhi and Subramanian Swamy; bestselling authors like Amish Tripathi and Ashwin Sanghi; stalwarts from the education arena like R Subrahmanyam, Anil D Sahasrabudhe, Anita Karwal, T V Mohandas Pai and others from various fields. 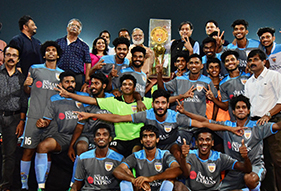 The eighth edition of the GOAL 2019, the annual All-Kerala Inter-Collegiate Football Tournament organised by The New Indian Express Group, was held at the historic Maharaja's College Stadium in Kochi between January 6 and January 20. The top 24 college football teams from four universities of Kerala participated in the tournament. All the matches were held under floodlights; two matches were held every day till the semifinals. 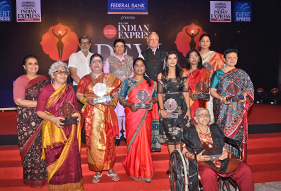 The 13th edition of the Devi Awards and the first in Tamil Nadu, presented by Federal Bank, was held in Chennai on September 11, 2018. Puducherry Lt-Governor Kiran Bedi was the Chief Guest. Event Xpress is a full-service management company that conceptualizes and implements the most thought-provoking and well-attended events for The New Indian Express Group and other clients. 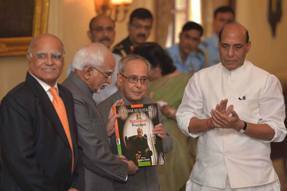 On October 7, 2015, Prabhu Chawla, Editorial Director of The New Indian Express presented the coffee-table book 'The Nationalist President' to the Hon. President of India Pranab Mukherjee. The book chronicles the life and times of the Hon. President, who is one of India's finest political minds. Compiled by the senior editorial team of The New Indian Express, it was presented to him by the Vice-President Hamid Ansari at an event in the Yellow Drawing Room at Rashtrapati Bhavan. The 16th edition of the Devi Awards was held in Delhi on November 13, 2018. Union Minister of State for HRD Satyapal Singh was the Chief Guest. 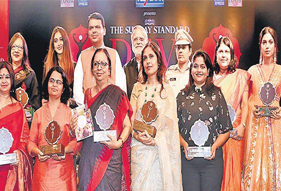 The 15th edition of the Devi Awards was held in Mumbai on October 10, 2018. Maharashtra Chief Minister Devendra Fadnavis was the Chief Guest. The New Indian Express' Odisha Literary Festival (OLF) celebrates the written word, in all Indian languages, including English. 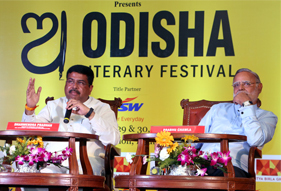 The seventh edition was held at Bhubaneswar on September 29 & 30. As always, all the sessions were lively, participative and entertaining. 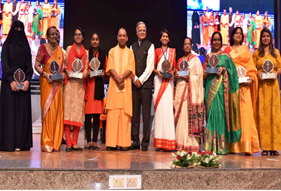 The 14th edition of the Devi Awards, and the fourth in Uttar Pradesh, was held in Lucknow on September 14, 2018. Chief Minister Yogi Adityanath was the Chief Guest.